. PMID 18663216. A published, apparently pre-Columbian, Chilean specimen and six pre-European Polynesian specimens also cluster with the same European/Indian subcontinental/Southeast Asian sequences, providing no support for a Polynesian introduction of chickens to South America. In contrast, sequences from two archaeological sites on Easter Island group with an uncommon haplogroup from Indonesia, Japan, and China and may represent a genetic signature of an early Polynesian dispersal. 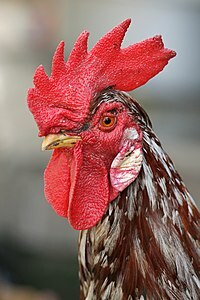 Modeling of the potential marine carbon contribution to the Chilean archaeological specimen casts further doubt on claims for pre-Columbian chickens, and definitive proof will require further analyses of ancient DNA sequences and radiocarbon and stable isotope data from archaeological excavations within both Chile and Polynesia.